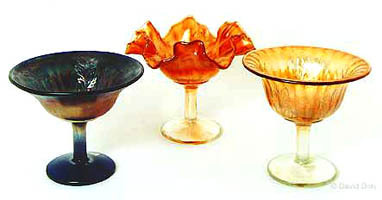 The Holly pattern runs the wide range of items from very common to very rare. This, of course, depends on which Holly pattern is being discussed. 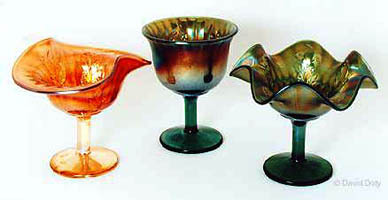 Holly patterns were made by Fenton, Millersburg, Dugan, and Northwood (and maybe others). 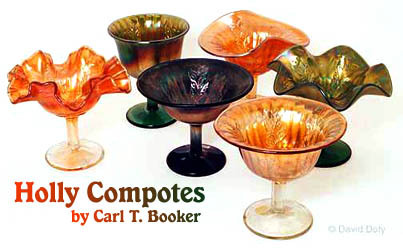 The Holly pattern that Eunice and I collect is the Fenton Holly Compotes (Goblets). I would be remiss if I didn’t thank (or blame) Mary Helen Yung for stimulating my interest in the Holly Compotes. The Yungs brought their collection for their room display at one of the conventions. It was very interesting and colorful. This started us on our way to searching for these cute little pieces of Carnival Glass. I have not seen a pastel Holly compote with pastel iridescence except the white one, but I’m sure they must exist. What is the appeal of the Holly Compotes? They are available, they come in a variety of shapes and colors, most pieces are not excessively expensive, they don’t take up much display space, and they show the pattern well. The most expensive Holly Compotes seem to be the Red Opal, Red, Lime Green Opal, and White. We’re sure that a true pastel with pastel iridescence would command a good price, also.